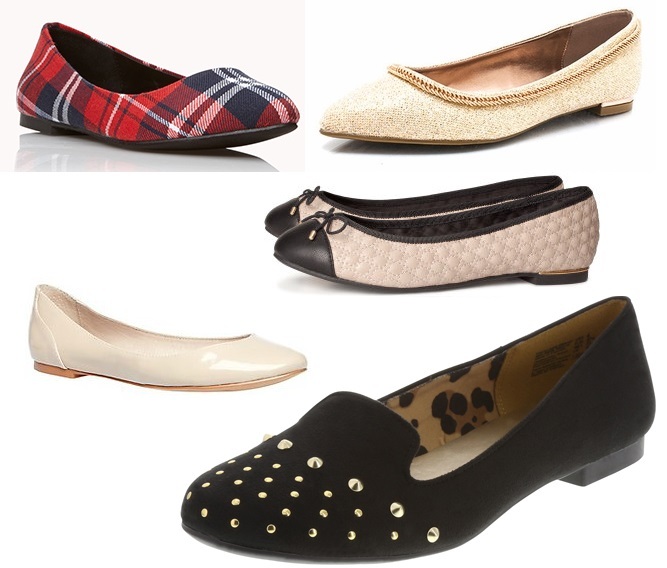 2013 Black Friday Style: Fashionable Flats For Your Shopping Frenzy! Whether you’re spending the holidays with family or hitting up the stores in search of the biggest & best deal, you’re definitely going to need a fabulous pair of shoes to help you along the way, which is why I’m happy to feature flats as a part of my 2013 Black Friday Style series. Having so much retail experience, I can tell you that flats are a stylish lifesaver to the working woman’s feet. I’m most inspired by details print & pattern, texture, shine, & menswear inspiration, which are essential ingredients to make any holiday season all the more special. Shop these: bold plaid flats ($16.80) in red multi @Forever 21, chain-ge glitter flats ($23.80) in gold @GOjane, quilted ballet flats ($9.99) in beige @H&M, patent KINGG flat ($41.98) in fawn @Steve Madden, & Christian Siriano crimson smoking flat ($26.99) in black @Payless. I know I’ll be breaking out my most comfortable & stylish flats this weekend (working the 2nd job! ), thinking about all the ways that I can style my flats with leggings & tunic sweater, blouse & skinny jeans, & a cardigan & A-line skirt with tights. How do you like to wear flats? Which style is your favorite? For more suggestions on must-have flats, check out these picks from White House Black Market, LOFT, Nine West, Charlotte Russe, Kohl’s, Wet Seal, & Tilly’s. Happy Styling! This entry was posted in #BlackFriday Sale Update, Basics for a Bargain, Holiday Gift Styles, Quickie Darling Deal & Steal, Show Me The Shoes, Style Darling Daily and tagged affordable fashion, Black Friday, Charlotte Russe, Christian Siriano, flats, Forever 21, glitter flats, GOjane, H&M, KINGG, Kohls, LOFT, Nine West, patent flats, Payless, plaid flats, Quickie Darling Deal & Steal, quilted flats, shoes, shopping, Show Me The Shoes, smoking flat, Steve Madden, Tillys, Wet Seal, White House Black Market. Bookmark the permalink. ← 2013 Black Friday Style: No-Sweat Sweater Shopping!